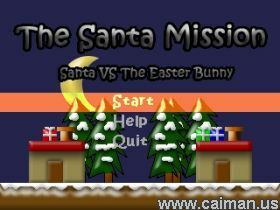 Caiman free games: The Santa Mission by LIJI. 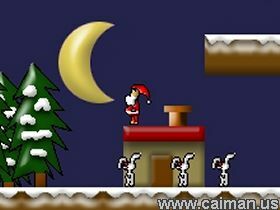 In this platformer you play with Santa who has to collect xmas presents. Avoid the bunnies or jump on their heads (just as in Mario games). You can enter the chimneys to deliver your presents and you will get some power when you do that. The Easter Bunny got mad at Santa because everyone like Santa more than they like him. The Easter Bunny sent his bunnies to make santa unable to give the gifts. The Easter Bunny says that if Santa won`t give the gift, the kids will hate him, and if the kids will hate Santa, they`ll love the Easter Bunny! You plays Santa and you need to give the gifts and fight the bunnies. Once you give a gift - you get a cool power! In the end of the game you`ll fight the easter bunny and teach him a lesson!